The chronological order of the Derinyi novels by Katherine Kurtz. I see you have introduced legislation for a new carbon tax. I find this disturbing but unsurprising. Leaving aside the question of whether or not a tax on carbon is justified or beneficial, I wonder if there is an upper limit on the amount of money you think is fair to confiscate from Washington residents. I’ve posed this question to you numerous times on Twitter, but, having received no response, am asking again: How much of a person’s labor do you think the government is entitled to? One third? One half? Three quarters? I realize this may sound like a trick question, but I think it’s fair and should be asked of every elected official. If you don’t have an upper limit in mind, how do you know when citizens have been taxed enough? And if you do have one in mind, don’t you think your constituents are entitled to know where it’s set? Every tax is ultimately paid by individual taxpayers, whether it’s a direct tax such as sales or property tax, or indirect, such as the B&O tax. Your proposed carbon tax is no different. Even though the story about a gay concentration camp in Chechnya has less than nothing to do with Christians, International Business Times has chosen to use a photo that implicates them. If you look closely at the photo, you can see that the signs include Christian scriptures, even though the article does mention – in the last paragraph and, really, how many people read that far – that Chechnya is a majority Muslim country that adheres to traditional Islamic values. The photo doesn’t appear within the body of the article; rather it appears as the default when the story is linked and shows up in a Bing search. Unless they want to claim stupidity, there’s no innocent explanation for this. 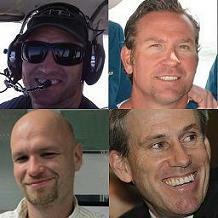 A simple error or more of the same from the Liar of Benghazi? First there was the Benghazi lie, in which she appeared on five Sunday morning news shows to tell the American people that the attack was motivated by a YouTube video. The Bowe Bergdahl lie, in which she assured us that the U.S. Army deserter had served with honor and distinction. The Turkish airbase lie, in which she stated that the Turkish government had agreed to allow their airbases to be used for operations against Syria and Iran. The unmasking lie, in which she first claimed she didn’t know anything at all about it, and then, after it was revealed that she had, indeed, requested the unmasking, stated, in a stunning display of grammatical malfeasance, that she “leaked nothing to nobody.” We’re still waiting to see if that last bit is a lie or not. And now, in the face of Syria’s recent gas attack on their own citizen’s, we have the chemical weapons lie, in which she said as recently as January that Assad had “voluntarily and verifiably” relinquished all the country’s chemical weapons. Why do people continue to believe anything this woman has to say? If she said the sky was blue, I’d go outside to make certain it wasn’t green. And for the love of God, who at the Washington Post thought this professional liar was qualified to write an op-ed on presidential truthfulness? Charles Woods, whose son, Tyrone Woods, was killed in Benghazi, suggested recently that perhaps Rice should take a lie detector test. He might be onto something there. Although I’m not entirely certain she couldn’t fool the machine. Susan Rice has no acquaintance with the truth and people who believe that she’ll ever tell the whole truth about the unmasking incident are – how can I say this nicely – delusional. I’ve written some not-very-complimentary things about Mitch McConnell, but when it came down to this Supreme Court nomination, he got the job done. From the Aussie Conservative blog. There is some good news amid an apparently changed cultural context, as despite extreme feminism and other Leftist causes being prevalent in public life, these ideas are becoming increasingly unpopular amongst the bulk of society. Clearly, the voices who shout the loudest and make themselves the most visible, are not always those who enjoy overwhelming support. While we should be proud that conservatives are more modest and pleasant in this regard, such an environment should serve as reason for an emboldened, re- energized populist backlash, to ensure that further ground is not lost on key social issues. Because as Hitler’s Germany proved, wicked ideas do not require predominance in a society, for great acts of evil to subsequently occur.